We all know about the importance of fathers spending time with their sons. It’s been said that the kind of man a young boy becomes, depends on what his father taught him during moments spent together. The relationship a boy has with his father greatly shapes the man he will eventually become but I got to admit - sometimes a father and son may have a hard time coming together and really bonding and understanding one another. Because men being men, we don’t like to sit face to face and talk about our feelings. It’s much easier to open up when we’re doing something side by side, and we can just let the talk flow naturally as we kick a ball, play video games or tinker with tools. And it is equally important to develop a tradition of doing father/son activities that will cement this bond because time spent bonding teaches us positive principles, instills honest values and virtues, and presents countless life lessons along the way. One thing most men and their sons have in common, though, is a love of cars - from the most exotic sports cars to the biggest monster trucks. And there is no better place to start than working on a car together. Which was what Ayd and I did at an Autobacs workshop. Yes, we even slipped into proper work-wear to prepare ourselves for the job! Unfortunately, many men today (myself included) are utterly clueless when it comes to basic car maintenance. So it is paramount to have a mechanic who is reliable, open and honest when it comes to having one's car serviced. Autobacs currently has 3 workshops in Singapore (one in Ubi, the other in Bt. Batok, and another in Caltex Dunearn) but did you know it hails from Japan? 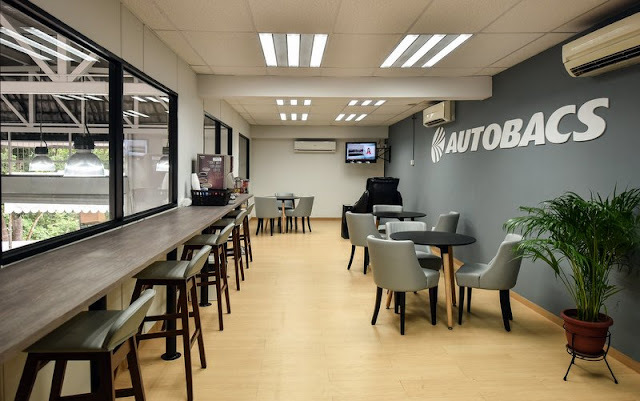 In Japan, it is called a ‘Car-life store’ – meaning anything that is car-related, Autobacs is sure to have it. So on a Saturday, Ayd and me headed to the workshop at Bt. Batok where we were given a crash course on how to perform basic car maintenance as well as change my car's engine oil. For Ayd, it was the first time he actually saw what lies underneath the bonnet so it was all very novel... especially when the first task he was assigned was to check my car's battery. Vijay, the friendly mechanic assigned to guide us, taught Ayd how to read the car battery report slip who then promptly declared that the car battery would probably last us for another 6 to 8 months. But for Ayd, that was not the highlight. This was. Raising my car so that we could change the engine oil. The car's engine is like the heart of the vehicle and engine oil is the blood of the engine. There are many brands and grades but only the right oil suitable to your car will guarantee superior lubrication and maximum protection to the moving parts in the engine. Only then can the engine life be prolonged. So not only is regular servicing and changing of engine oil important, picking the correct engine oil for your car is equally paramount too. At Autobacs, its mechanics are highly qualified to offer the best recommendation. And guess what, its prices are transparent with no hidden costs. And speaking about transparency. the servicing is exactly that too. Customers will be able to wait in an air-conditioned room, which comes with massages (via a massage chair) and WiFi. Okay but back to my car. Vijay recommended synthetic motor oil for my car as such oils use a specially blended formula developed by researchers in a lab environment. Most often such oils use a variety of high-performance additives to provide a high level of engine protection at startup and while running. In addition, the best synthetic oils offer protection against heat build-up, enhance engine durability, and help clean engines of deposits. As we waited for the engine oil to be emptied, Vijay taught Ayd how to check tire pressure like a true professional! He soon took over, with me being relegated to just being his assistant. Then it was time to pour in the new engine oil. Ayd learnt how to use the dipstick to measure if the depth of the engine oil was adequate. And then came the fun part of all - blasting away any foreign objects like leaves and twigs in the engine area with an air spray gun! A few more tightening of screws here and there, and we were done! All in a morning's work! It was immensely satisfying to be able to work on our own car together with Ayd and I think he thoroughly enjoyed the exclusive one-to-one bonding session. A huge thanks to our mechanic Vijay who was extremely knowledgeable AND patient with Ayd... who was erm, peppering him with endless questions about the car throughout the session. 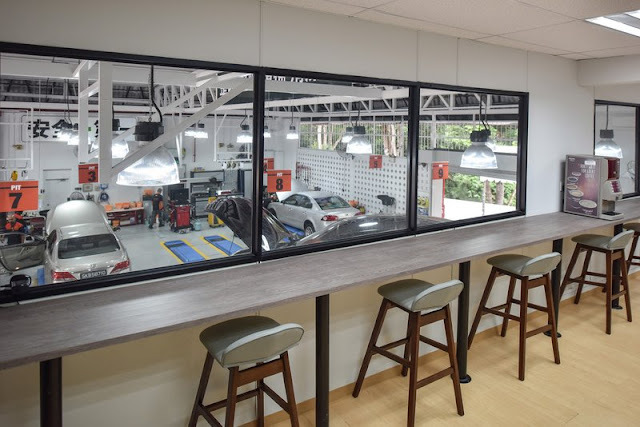 If you are planning to service your car soon, GREAT NEWS! 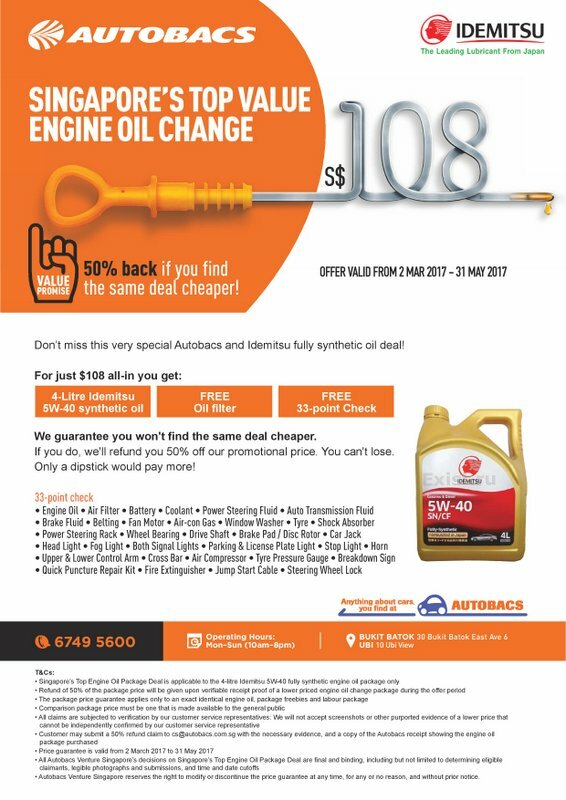 Autobacs has partnered with Idemitsu to offer the best valued engine oil servicing package in Singapore! Priced at $108, the package includes 4L of 5W-40 fully synthetic engine oil, free labour, free oil filter and 33-point check. This is the BEST valued servicing package in Singapore. In fact, Autobacs is so confident that it impossible to find the same elsewhere that they will refund 50% of what you paid if you find the same deal cheaper at other workshops! Oh, and you can skip the queue and book your appointment online HERE as well!